time. After filling out a form and getting my free hat I briefly walked around the track before heading outside to the paddock area. Me and jockey Joanne McDaid. The track reminded me a lot of Monmouth Park in the way it was shaped. The track is a 1 mile surface with a turf course. There was over 17,000 people here on this gorgeous day and it was the perfect day for racing. Race #1 was a claiming race going 1 mile with a purse of $6,250. I played a $2 exacta straight 6/1 & 6/4. The 3 horse with Josiah Hampshire jr stalked the leader and in the stretch took the lead and never looked back and I lost ha ha. After the race I did get my picture with yet another female rider (ha ha). This time the victim was apprentice rider Joanne Mcdaid. Hopefully we can interview her for the female jockey website I do with Jim. Race #2 was another 1 mile affair with another purse of $6,200. I play $4 to win on the #4 as I like jockey Headley Betancourt and he is a closer. The #4 is nowhere to be found as Orlando Bocachica wins going away. Things aren't looking good, but I find another female jockey victim, this time it's Tamay Alpander. She was nice enough to smile and put her thumb up too ha ha. Race #3 is a $40,000 minor stakes race and the race is going 6 furlongs. I play Tammi Piermarini on top as she easily has the best horse and I play her on top and she goes wire to wire and I hit the trifecta. I get back $30, which was cool as it is the 1st race I hit at Suffolk. Was cool watching Tammi get her picture in the winner's circle too. 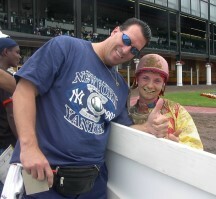 Me and jockey Tamay Alpander up at Suffolk Downs. 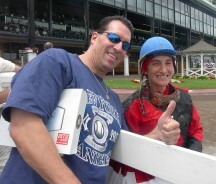 Me and jockey Tammi Piermarini. Race #4 is on the turf going 7 1/2 furlongs and looking at the program #6 looks like the best horse and I throw $5 to win on him and also a $3 exacta with the #4 horse, who is a semi long shot. The #6 stalks and then takes the lead in the final strides to pull away from a stubborn #4 horse. I collect a win and exacta bet. After the race I call Tammi Piermarini over and get her to sign my picture I brought with me of me and her and we also take a new one and I tell her congrads on her stakes win and she wishes me well and she goes on her way. Race #5 is a 5 1/2 furlong claiming race with a purse of $10,000. I play a $4 exacta straight 5/1 & 5/2. The 5 is up there, but quits and my 1 & 2 are nowhere to be found and the #3 with Edwin Molinari wins the race and I lose ha ha. Race #6 is a 6 furlong claiming race with a purse of $14,000. I play a $2 trifecta 3/5 with 3/5 with 2. The 5 wins with Josiah Hampshire Jr. going away and my 3 horses finish right behind him and I don't collect. Race #7 is a $22,000 allowance race going 6 furlongs on the main track. I decide to play another trifecta looking for the big payout ha ha. I play the 5 on top as he on paper is the horse to beat with a 1/2 behind him. The #3 horse, which usually takes the lead and fades, doesn't fade this time and he wins and I lose ha ha. Race #8 is on the turf, The Old Ironside Stakes for $40,000 going 1 mile and 70 yards. An Argentinia horse is in this race and I don't play him and he comes off the pace and goes past a hard charging #10 and wins at 10-1. Race #9 is the $200,000 James B Mosley Breeders Cup going 6 furlongs. I see Chuck C Lopez is up riding in just this one race. I throw $5 to win on him. I also play a few different trifecta combinations. I also see Trainer Scott Lake is up here and he has a horse in this race and I go over and talk to him briefly and then go and watch the race. Chuck C Lopez stalks the front running #7 with local jock Dyn Panell and blows past him for an easy win. The #3 finishes 2nd and the #5 is 3rd and Scott Lake finishes 4th and I only hit the win bet. Lild who was 15-1 and I tell her Edgar Prado should have stayed home he has no shot. I throw him out of the race completely. It ends up being a great race and there is a 3 way photo and the lo and behold the #1 with Edgar Prado wins and somebody knew something he was 15-1 morning line and he was bet down to 3-1. Funny Cide ended up 2nd. It was a great race and we decided to head out out back to Rhode Island. All in all I had a great time at the track and I cashed a few tickets, got a free t-shirt and hat, hung out with my friend Scott and spent an incredible weekend with my future wife Melissa. See ya next time in the winner's circle.